This popular 20 plan is a perfect vacation home with all the amenities you could wish for. Contemporary furnishings throughout in warm soothing colors and a spectacular southern mountain view with sunshine all day long! Comfortable furniture surrounds a large flat screen HD cable TV in the living room. 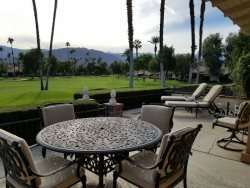 Step from the living room onto the extended back patio for wonderful mountain views and overlook the South 2nd Fairway. The dining room is beautifully furnished with seating for up to six. The kitchen is well stocked for those who love to cook. The master bedroom is furnished with a king size bed and cable TV. The private bath has a walk in shower. The guest bedroom has a queen size bed and cable TV with bathroom adjacent with shower/tub combination. Quality linens and bedding complete the warm inviting feel of this vacation home. Also included are wifi and free US and Canada long distance calling. Blue ray DVD player in living room. Don't miss out on this charming vacation home, we know you will enjoy your stay! Owner may consider a small dog, paying a pet fee. Please inquire first. No large dogs! No smoking! I found the staff polite and accommodating. Great! we want to come back to that location. Everyone at Vacation Rentals of the Desert was helpful, polite and responsive. It was so easy to make the arrangements. We had a wonderful time and thoroughly enjoyed our stay. We are already planning for next Christmas and will be in touch soon to make those arrangements! Kathy was FANTASTIC and so helpful.